I make a point to maximize FO slots whenever possible to exploit as much shooting as possible. All ork lists need it against opponents with capable shooting of their own. Without fire support your vehicles can get shot to pieces before their payload ever arrives. This list combines some of the most powerful units in the codex into one list. We see the KFF Mek here again. This time just a singleton however. Stick him with one of the boyz in a wagon and he'll grant all your AV 14 Wagons a 4+ save. He's accompanied by the Warboss paying a nob tax and a unit of nobz that now can be scored as troops due to his inclusion. This list has 3 battlewagons all outfitted near identical. Deffrollas are one of the most powerful things in the codex and that's our primary reason for using the wagons. They also double as an AV 14 shooting platform, allowing our shoota boyz to rain down death from the safety of the vehicles if needed, or they can simply debark and charge forward after their wagon has delivered them where they need to go. Accompanying the KFF shielded wagons are 3 buggies with rockitts, useful for picking apart enemy vehicles. This list can deal with armor without issue. That's 15 lootas, 3 TL Rockitts, 3 Deffrollas, and 3 effectively TL Kannonz along with a resilient troop base. This list is shooty, and this list is fast. 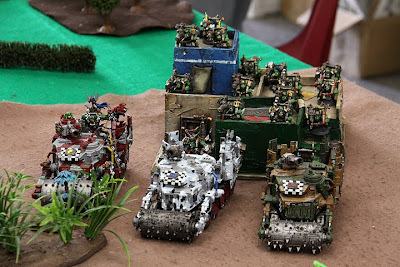 It can get your orks where they need to go and they can do it with authority. At 1750 we can make some additions. Notably upgrading the Warboss to his named counterpart: Ghazgkhull Thraka. Ghazghkull is a potent special character with a heavy point cost. No matter. He's worth it. A whopping 7 str 10 powerklaw attacks on the charge, a 2+ save, the ability to make your entire army fearless for a turn, a 6" waagh, and an invulnerable save. As I highlighted here, he's one of the best HQ's in the codex. If you have the points you use him. We do. We will. At 2000 points we finally drop the Kannonz unit and add a 4th wagon. I think at this point level the list might have a few scaling issues as we start running out of units to take, but 4 wagons is certainly better than 3 if you can swing it. We can still use them and provide a 4+ save with our KFF a majority of the time. Mech Orks obviously plays differently the Kan Wall Orks. Both lists can be effective at all point levels though. Either one can work in your meta-game. 6 Response to "Army: Mechanized Orks"
I like the list and think it's pretty nasty. However, since your BWs will most likely move twice before unloading and then have Ghaz's 6", you could probably drop the RPJ and pick up a different 5 pt option. Maybe grabbin to help with any skimmers. Grabbin Klaws would be nice. The benefit of the RPJ is that I can move 7", shoot with my boyz from the BW and my opponent can only hit the vehicle on a 6+ in assault. If I wanted Grabbin Klaws maybe I could cut points elsewhere (like cut a few boyz for example). So, I notice that in the Kanwall list it's all Koptas, and in this it's all Buggies. Is the premium you pay for the Koptas buzzsaw basically redundant when you already have some ability to deliver CC attacks to bothersome units (i.e planks and PKs)? How important is the movement-blocking aspect of the buggies for this, or other mech armies (i.e would doing 1 kopta /w rokkit x3 be more or less equivalent to doing 1 Rokkit buggy x3)? I notice in an older list you mixed buggies/koptas, did you just find the koptas weren't adding much or were they cut for cost as I think the older list had a trukk instead of the 3rd BW? I like the list and am planning on using something very similiar (MANz in place of the Nobz, 3 units of 2 buggies, no kannons). Yeah I don't feel the Koptas are necessary in a mobile list like this. I also think the buggies are much more durable hiding behind KFF Wagons and like them in a list like this as opposed to a list where they run around out in the open without cover saves. The primary reason to take Deffkoptas are the Buzzsaw. Without them I consider them strictly worse than buggies aside from the occasional outflank. They are a bit more fragile and cost more points. Just doesn't seem worth it to me unless they have the ability to charge the rear armor of a Leman Russ. I marry wagons to buggies. Shaving points elsewhere to get more of them is a valid strategy. The more fire support you can get behind your wagons the better. They won't make it across the table without it. Quick question, instead of the 3rd BW, would taking a small nob biker squad be viable? Works out to about the same as taking the BW+Nobz+Warboss on foot. I tend to like nob bikers in larger numbers. They are a bit fragile as a smaller unit. However if you can keep them hiding behind the other wagons out of LOS right before an assault they might work in that capacity.